The National Library of Medicine Division of Extramural Programs announces the 2013 NLM Informatics Lecture series showcasing NLM-funded research in biomedical informatics. Chunhua Weng, PhD, will present on March 6. 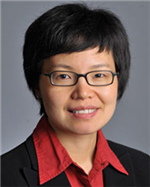 The program kicks off March 6 when Chunhua Weng, PhD, presents “Bridging the Semantic Gap Between Research Eligibility Criteria and Clinical Data: Methods and Issues.” Dr. Weng is the Florence Irving Assistant Professor of Biomedical Informatics at Columbia University. Her research centers on developing human-computer collaborative approaches to help clinical researchers make the best use of health information technology. She currently is focusing on problems that include interactive query formulation to assist clinical researchers in interrogating large clinical databases. The lectures will be held 2:00 p.m.-3:00 p.m. in Balcony A of the Natcher Building (Building 45) on the NIH campus. All three talks will be videocast live and archived at http://videocast.nih.gov. February 20, 2013 in Events, Grants & Funding.